n Adventure Land, King Agamis rules from his castle. Rich cities, vast forests and rugged mountain ranges dominate the country. The large river is known to be lined with gold and the forests filled with medicinal herbs, but dangers lurk beneath the fog! Only the bravest adventurers dare to face the challenges. When you move your adventurer tactically and bravely fight the fog creatures, you'll win the favor of the king. 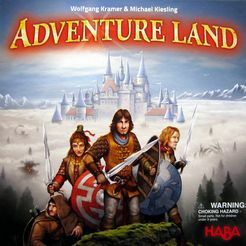 Illustrated by Franz Vohwinkel and designed by acclaimed duo Wolfgang Kramer and Michael Kiesling who between them have won the highly coveted Spiel des Jahres award 5 times.